That’s right folks; CorkSport’s favorite skid trays have made their way to the GEN3 Mazda 3. Whether you have a broken OE plastic skid tray or are just looking for some extra protection for the winter months, please welcome the CorkSport 2014-2016 Mazda3 Skid Tray. Made from laser cut, 0.090” thick aluminum formed to a perfect fit, this skid tray is a direct upgrade from the OE Mazda3. 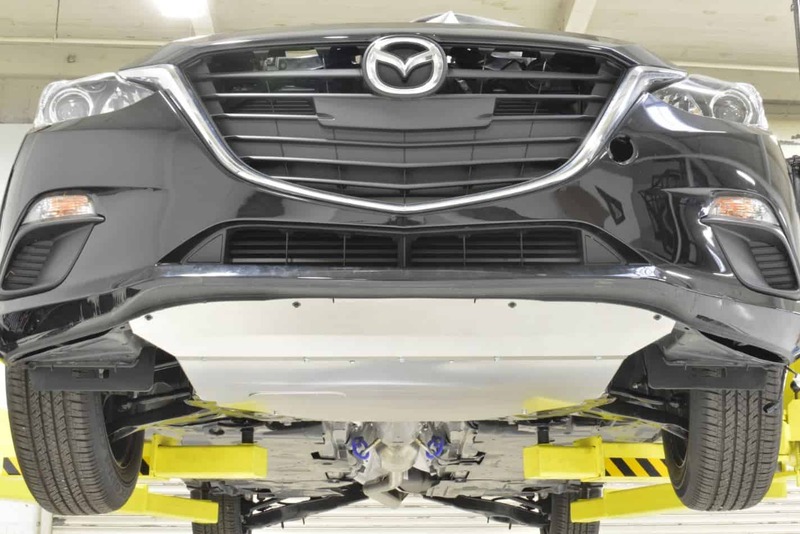 From the factory, the GEN3 Mazdas come with a flimsy plastic under tray that can crack and break with the smallest of impacts. 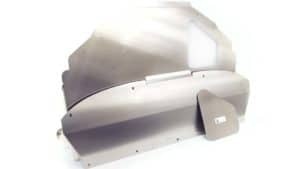 It exists primarily to smooth the airflow traveling under your car and act as a splash shield for the engine compartment while driving in the rain but offers no real protection for your oil pan. We felt compelled to remedy this issue, and thus, the CorkSport Mazda3 Skid Tray was born. The 0.090” thick aluminum protects your Mazda 3 from road debris, rocks, and damage to vital engine components while adding minimal weight to your car. 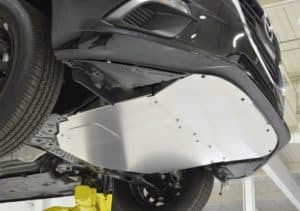 This aluminum is the same material as our Mazdaspeed 3 skidplate, and it has proven itself to take plenty of punishment. 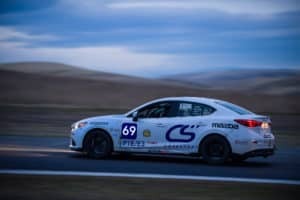 We even torture tested one of our prototype skid trays during the 25 Hours of Thunderhill on the CorkSport Mazda 3 Race Car and had no issues. As always, we sought out to make the installation as painless as possible while retaining all OE features. The CorkSport skid tray only uses the OE mounting locations without having to drill or trim anything. The CorkSport Mazda3 skid tray is a two-piece design that allows for a more straightforward install. Each piece is more manageable to move around for installation than the traditional one-piece design. As a bonus, it also makes the shipping is cheaper! We retained The oil and filter access panel so you can easily perform maintenance without having to remove the Mazda3 skid tray. By extending the front of the skid tray above the bottom of the front bumper like OE, the CorkSport Skid Tray retains the smooth transition from bumper to skid tray to ensure smooth airflow under your car. You can even run the CorkSport Skidplate with the Mazda OE front lip with no issues. If you’re worried about your oil pan or can’t seem to keep an OE skid tray in one piece, let the CorkSport Skid Plate for 2014-2016 Mazda 3 alleviate your issues. P.S. Our two-piece design allows us to develop fitments for other models. If you’re interested in a skid plate for your car, let us know, and we might start work on one for you!